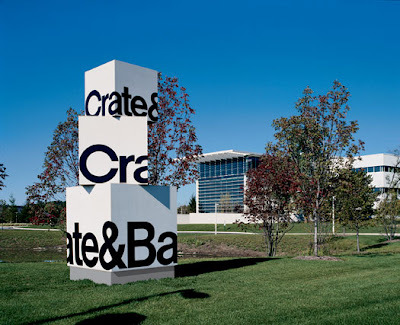 That's right, it's the Crate & Barrel headquarters! Who knew that one of my favorite housewares, furniture (indoor and out), and home accessories retail stores was headquartered in the city I lived in?! Nestled on a tree lined road minutes from my house, was the mecca of housewares! So for this week's Foodie Freebie Friday, I've giving away your choice of the above Crate & Barrel housewares which will come straight from their online store. The winner of this week's giveaway will have their choice of either the Cafeware II Dinnerware Set or the Parker Mixing Bowl Set. These two items are probably the most used Crate & Barrel housewares I own and have served me well. I'd like for a lucky reader to enjoy these as much as I have too! - Your favorite housewares/kitchen item. Was it a gift? Any special story behind it? What makes it your favorite? I'd love to hear all about it! Deadline: Thursday, February 5, 2009 at 12 midnight CST. TWO Winners will be randomly chosen by Random.Org's Interger Generator based on the number of your comment and will be announced on Friday, February 6, 2009. Good luck! My fav kitchen item is def my KAM. My dad gave it to me for Xmas one year. It's red and I love it. Even thought I only have about 30" of usable counter space in my kitchen, I leave it out because I use it so much. My favorite kitchen item actually has a Crate & Barrel connection: It's a set of white "pasta bowls." all over the place. Large, shallow bowls meant for eating pasta. Most of them are decorated with an Italian theme. Mine are white, which keeps them from being typecast as pasta bowls. My Grandmother, who was probably in her early to mid-80s at the time, asked me for a list of Christmas present suggestions. To make it easy for her, I gave her ideas from catalogs (this was pre-internet!) so she could easy shop & have them shipped to me. 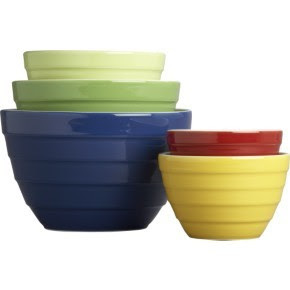 The ordered for me a set of 6 or 8 pasta bowls, plus a matching serving bowl. I infrequently cook pasta, but I use those pasta bowls almost every day. They're great for soups, stews, anything with a little bit of liquid or sauce. I use them when I've run out of regular bowls. I use them when I've run out of regular plates. Last night I served pasta in them. My cats use one as a food bowl. I love my now 95-year-old Grandmother, and I love my pasta bowls! favorite kitchen gadget has to be my zester. Sounds crazy but I'm a huge lemon fan and I use it all the time to grate lemon zest! Without a doubt, my favorite kitchen item is my bright, bold, empire red KA mixer. It was a gift and every time I use it, the color makes me happy. Some people warned against getting red. "You'll grow tired of it," they said. They must not have known me very well because, four years later, I still smile every time I see it! My favorite kitchen item is my wok! It was a wedding gift from my best friend's grandmother. We just made some stir fried noodles and veggies yesterday. Yum! I always drool over the Crate & Barrel catalogs when they come in the mail. Before this month I would have said my KA mixer, however, having just bought the Cuisinart hand mixer/immersion blender, I have to say I don't know how I survived before. It makes such easy work of chopping and blending and takes up so little space - my new favorite! I absolutely love all my Le Creuset pieces . . . I have 2 dutch ovens, and a couple of baking dishes that I use allllll the time. They are so versatile, easy to clean, and great for cooking on the stove or in the oven, with even heat. They were all wedding gifts or birthday gifts - although I found a couple of smaller pieces for myself on MAJOR sale at Marshall's! I think one of fave kitchen item is my Calphalon panini press. I love making the perfect grilled cheeses, breakfast sandwiches, and the ultimate cuban sandwich!! My Kitchen Aid mixer forsure, it was a wedding gift from my in-laws I use it a couple times a week, I LOVE it! I think one (because I have many) of my favorite kitchen items would be my KA hand mixer. I have a very small kitchen so counter space is VERY important to me. Knowing this, my Mom suprised me with this mixer! It's perfect for everything I make from bread to cakes... it does it all! A close second would be my over the sink cutting board with built in strainer. You have to get creative with minimal counter space! Before my birthday I would have to say it was my KA mixer... I love it so much and try to find a use for it almost daily for the past 5+ years. Amazingly it still hasn't fallen apart on me :) But on my birthday I was given a Calphalon dutch oven and I love it. Although I still need to find more recipes to use it. My kitchenaid mixer. It's light blue and a surprise gift from my husband before we were even engaged! I'm having a hard time picking my favorite kitchen item, there are so many! While I love my KA mixer, I'd have to say my current favorite is my le Creuset french oven. I'm using it constantly making stews, soups & goulash. oye, my favorite? I would have to say my heart spatula/bowl scraper. I always use it, and it is so cute. It is a tossup between that and a bowl that my grandmother passed down to me that has sentimental value. It is also a mixing bowl with a handle, my favorite bowl. I love my garlic press. My mother-in-law gave it to me and it works like a champ! Much better than my crappy old one. It's from Target, and looks like an OXO one, but it's their knockoff. It's heavy duty and crushes garlic very good! Hands down, my Henckel's knife set. Sooooo sharp and durable. Definitely the kitchen tool I use and lurv every...single...day. My favorite item is my big chopping block. We got it as a gift at our wedding. I use it nearly every day and it definitely makes my life easier in preparing meals! I would say my favorite item is my most used item...my silicone spatula(s). It may seems silly that it is my favorite...but I use them all the time. One day I made 3dishes back to back and I used 4 silicone spatulas! OMG! Those are my plates! And I have been looking everywhere for them as I need to replace them. I went to Crate & Barrel to get replacements and they said no, they no longer carry them. But here they are online! WOW! I wish that store clerk would have told me about them online. Maybe the outlet is the only place to carry them. Well, I would love to have these are they are my favorite all time plates. So sturdy and the main reason I bought them is because they are so durable, perfect for stacking, and photograph really well. So excited about this FFF!!! I love my KA stand mixer. It's silver and so pretty. I got it for my husbands birthday:)...nice present! I use it all the time and every time I use it I think about how lucky I am to have such a wonderful husband...that buys me presents for his birthday. It's so dependable and it whips through any type of batter in no time. I also love the versatility of it and that it has so many attachment options. I got my first attachment for Christmas, it's the ice cream maker. I can't wait to make some ice cream. I'm jumping on the KA bandwagon...My KA mixer is my fave kitchen "gadget". I got it from my mom and my grandma for our wedding shower, it's pink and when I saw it was bought off the registry, I literally started crying!!! Having it come from the 2 of the best women in my life was the icing on the cake!!! Mine would have to be my cutco chef's knife. I use it everyday, and it never fails me. My chef's knife. My two brothers and I gave each other a set of nice knives when we each got married. Mine are wusthoffs and I love how sturdy and dependable it feels when I use it. What a hard decision! I think my favorite has to be my Cuisinart Mini Food Processor that I received as a shower gift from my aunt. It's the perfect size and easy to clean up for small projects. I love my big one as well, but the small one is just perfect! My favorite item would have to be my KA mixer. I bought it when I took some cake decorating cakes and my mom also took the class. I have many fond memories of mixing up huge batches of icing and the two of us frosting our creations. New favorite tools -- my teak 'wooden' spoons. I can't use real wooden spoons because they give me a serious case of goose-bumps but these are smooth and soft! No question, the electric kettle... I drink tea religiously so it gets more use than any other appliance I own. I tried to share the love and bought one for my younger sister when she went away for college-- the dorm confiscated it! My favorite kitchen item is by far my santoku knives. One is made by Cuisinart and the other is made by a Japanese company (the name escapes me now). They make my life in the kitchen so much easier. My favorite kitchen applicance is my kitchen aid mixer. When my grandmother died, she left any items that someone bought for her back to that person. My aunt had bought her her KA mixer, and since she had her own, she gave it to me (I was 21 at the time) since she knew I loved to bake. Not only did I not have to wait until I got married to get this mixer :) I think of my grandma everytime I use it. Well I do indeed love my KA mixer, a bridal shower gift from my mom, but my favorite houseware is a chip and dip serving dish from a local pottery store. I only bring it out for special occasions but I always get compliments on it. A close family friend gave it to me as a wedding gift and I love that it's unique and personal. My favorite item is my food processor. I'm know for cutting myself while chopping because I think I can go faster than I actually can, so something that keeps the blades safely away from my fingers is a good thing. i have to go with my trusty Kitchen Aid Mixer-i love it! My mother gave it to me as a wedding shower present. I have gotten so much use out of it. I have too many favorites that I actually use, so I'll name one that I don't use. I have a candy thermometer circa my great-grandmother. It's hanging up on my kitchen wall, and every time I look at it, I'm reminded of the generations of wonderful cooks in my family! my favorite kitchenware item is my KA mixer..it is the large size and i love it. i use it sevearl several times a week and cant use it enough.from breads, to cakes to cookies, to whipped creams, etc..it all come out perfectly...i got this as a shower gift from my very very very generous and wonderful sister..
My favorite houseware item has got to be my salad bowl & servers from Crate & Barrel. It's from the Acadia line and it's a gorgeous wooden bowl with the matching spoon/fork. I absolutely love it and it WOWs my guests whenever they come over. My favorite item is my cookie press! I love to make cookie press cookies at Christmas b/c it reminds me of my childhood. This is very random because I change my favorite kitchen item weekly but currently it's gotta be my potato masher. Joelen, you are too kind! I am going to have to agree with alot of the other people and say that my Kitchen Aid stand mixer is my favorite kitchen product. My sister gave it to me for Christmas about 5 years ago and I use it at least twice a week. I really love my outdoor grill too, I miss it so bad right now. I can not wait for warmer weather so I can grill out again. I love my stainless mixing bowls. I got a set of three (from Martha Stewart's Macys collection) as a shower present. I think I use at least one of the three every single day. I would have to say my OXO steel garlic press. It is the best thing ever - works like a charm! I'd never had one before, so it definately makes life easier...no more chopping garlic for me! One of my favorite kitchen gadgets is my Pampered Chef can opener. I lost one while moving last year and used the one my boyfriend had and I can't tell you how miserable I was! That can opener is so easy to use and cuts around the outside making "lids" that are easy to remove and can be reused! What's not to love?! My favorite kitchen item is our Cuisinart Wine Cooler. It was a shower gift and many of my friends tried to put it in their trunk after the party! I love it because I have wine ready whenever I am and it keeps our purchases safe from heat. I Love my Pampered Chef Baking stones and my Kitchen Aid mixer....PC I bought years ago and can't imagine not having it and the Kitchen Aid was a wedding gift that gets much love. I love my Pampered Chef spoonulas. I use them for everything, and they're so sturdy. They were a gift from my mom who went to a PC party, thought of me, and bought me a few things. my favorite kitchen item is actually my magnetic spice holders... i have a small kitchen so having these displayed on my fridge not only makes cooking faster (b/c i don't have to hunt for a spice) but it makes my kitchen so much more organized! I could easily answer my Kitchenaid Mixer because it's so beautiful and I always wanted one, and because I have only gotten to use my new enamel cast iron pot once it doesn't qualify for favorite status yet...but I for sure would be a much less happy cook if I've never gotten my Cuisinart mini-prep. Love that thing. LOVE my KAM, but most of all I love that it is stylish enough to leave out all the time. It was a wedding gift from my boss! my favorite kitchen item has got to be my KA mixer. I use it all the time and cannot see myself using anything to get the job done. I got the ice cream maker attachment and now love it all the more! i'll never buy ice cream again! I love my Le Creuset dutch oven that I received from my husband this past Christmas! I've had my eyes on them for years. Man I love your blog. I wish I was Foodie enough to join the Meetup (which is where I found your blog!). Decisions, decisions. My Pampered Chef corn-cob holders (I swear, this was like a revelation to me)? My great-grandmother's silver salt & pepper shakers? The Imperial Grey KA I dreamed of, got for Christmas in 2007, and have never used? No, I think it must be my simple blender. I live for smoothies in the summertime, and the Osterizer was the first appliance must-have I bought when I graduated a couple years ago! It lies neglected in my cupboards for several months of the year, and makes its triumphant return as the glory of Spring arrives! And, as if it didn't garner enough admiration from me, I recently used the food processor attachment that came with it... and fell in love all over again. I *LOVE* my medium-sized Pampered Chef scoop (that I actually bought from you!). I've used it for SO many things in the kitchen and could absolutely not live without it!! It's so hard for me to choose a favorite kitchen item, but lately it's been my immersion blender. I am using it SO much in this weather now that I am making soups so often! I like my rice cooker. I've grown up eating rice as the main dish and have other foods complement the rice. I can't mess up rice this way! I love my mini food processor and the Cuisinart griddler. I use both of them all the time! The Griddler was a wedding gift from DH's friend. He makes pancakes on the griddle side every weekend, and I use it for dinner for fish, chicken, paninis, etc. Love it! oh and i do love my flexible cutting boards too! My favorite kitchen item is/are my silicone spoonulas. These are great to use in my nonstick pots/pans to cook and to mix batter and ensure that nothing gets left out in the bowl. There are much more uses that I can't think of at the moment but I just had to comment that I love spoonulas! My favorite kitchen item is my set of cake pans. They belonged to DH's grandmother, and although I never had the chance to meet her (she passed away the year before we met), every time I prepare a dish in those pans, I can feel her love, and when we eat, we know she's sharing the meal with us. My favorite kitchen item is a tie between my combo food processor/blender, and my stainless steal Cuisinart pans. But the pans have a better story. My pans were not the ones I originally registered for. I registered for non-stick, hard anodized pots and pans. My mom's best friend (like an aunt to me) bought them for me as a wedding gift, but also pointed out that they were not dishwasher safe. I had been weighing the dishwasher safe vs. nonstick and been wavering. She told me about her stainless steel pots and pans, and that they cleaned up just as well as any nonstick she had ever seen (maybe better) as long as you soak them in hot water. So we followed her recommendation and exchanged the anodized for stainless - and OMG we LOVE them!! And the clean up even better than promised. I have an ivory glass dish that I got as a wedding gift from my husbands Aunt. The cool thing is, the dish was once her wedding gift. And she has been married +50 years, so I always feel like it's a good omen. I wish I had a KitchenAid Mixer to sing the praises of! Instead I'll have to say that my favorite is my Silpats, which were a bridal shower gift off of my wedding registry. I do a fair amount of baking of both savory and sweet items, and those Silpats have become an absolute savior, even helping to protect my food from some horrible dark pans that would've otherwise obliterated my baked goods. I don't know how I lived without them at Christmas cookie time in previous years! Bread machine, definitely. I love fresh bread but don't have much time to make it so the bread machine saves me. It's not something I ever would have asked for but my mom bought it for my last birthday and it's become the most used thing in my kitchen. Its a toss up between my KAM, because its the coolest ever. And its so versatile. The second, in my total dorkiness, other fave are my collapsible measuring cups. 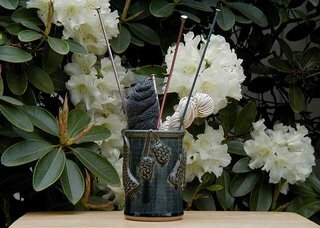 What a great giveaway - I LOVE those bowls! My favorite kitchen item is my KitchenAid...although my expanding stomach would probably disagree. I just love to make treats for my family and friends. I got the ice cream attachment for Christmas and love that I can make up some ice cream whenever I feel like it without leaving the house! I would have to say my favorite kitchen item is my rachael ray knife and my flexible cutting boards. I have 3 sizes and they are so easy to clean and store. The rachael ray knife I bought on a whim at TJMaxx and it is now my fav. The grip feels so good in my hand. Like many others, my favorite item is definitely my KA stand mixer. I don't know how I ever baked without it. Plus, it's very special to me because Eric's mom (who is like a mom to me) got it for me for Christmas in 2007. That mixer was the only thing I was disappointed not to get from our wedding registry. I was so surprised that Christmas morning to open up a present with a beautiful, green apple colored KA mixer! My fav kitchen item is def my calphalon soup pot. The kind with the strainer and steamer. I got it as a shower gift from DH's bff mom! haha its my fav gift and I use it all the time. Thanks Mrs. Z! DEFINITELY my Kitchen Aid mixer -- I use it all the time! I could say a lot of things, but I think my favorite these days is my blue plates. They were a wedding present 3 years ago, and I only have 4 of them. They're oval-shaped and I use them for special occasions, for serving platters, or just to make me happy! They are something so simple, but so much fun and always bring a smile to my face. My favorite kitchen tool is the knife block set. I got it as a wedding gift! I hate to join the club, so to speak, but I use my Kitchen Aid Mixer 3-5 times a week -- it definately gets a lot of use! I'd say the only thing I use more often is probably spatulas! Its hard for me to choose a favorite! If I had to narrow it done, one of my top favorites would probably be my 13 quart Le Creuset Pot. My husband knew I had the smaller 3 quart pots and needed a larger so he went and bought the largest he could find! Hands down, my mandolin, it's great I can slice vegetables, fruits, cheeses and whatever else effortlessly. I heart it and am glad that due to my Korean upbringing I grew up with it! My favorite kitchen/housewares item is the multi-chopper/mixer/immersion blender that my fiance brought into our kitchen when we moved in together. I was used to using my individual mixer and food processor. When I was in a pinch, I tried the old school mixer/food processor/immersion blender thing. From the instant that I tried it, I loved it. I use it for everything ranging from mixing cake to processing bread crumbs. It's such an awesome kitchen item that's old school and still holds up well to all of the wear and tear of years of use. My favorite kitchen items are our Houdini wine opener and our 16-bottle wine cooler. My husband and I are avid wine drinkers, so we really can't do without them. Both were gifts for Christmas 2008 from my husband's family. They know us "oh so well!" I have so many favorite kitchen items it's hard to pick just one...most of them are pampered chef. One at the top of the list is my pampered chef can opener. I must admit it took me some time to figure out how to use it but now I love it! Oh definitely my KA mixer! I can't imagine life without it! I love baking bread, and it makes it SO much easier! Oh, that would have to be my breadmaker. I rarely cook bread in it, but it lets me make the dough while I move on to other desserts or dinner components. My favorite kitchen item is my food processor. I use it at least once a week. It comes in so handy for shredding things, and pureeing as well as thoroughly mixing. I even used it to knead bread! I wish that I had invested in a bigger one though! Hi, It has been 23 years since I've made crepes -- this article has inspired me to make some right now. My Kitchen Aid mixer! I unknowingly acquired it in a way I wasn't supposed to. I moved to a new area of the country and went into this one store several times over the course of about 5 months--to look around, to buy a vacuum, and to buy the mixer (on sale). Then I went in to look for something else and was stopped by an employee. I had no idea this was a members-only store! I'd been there half a dozen times and bought things maybe three times! I don't think she believed me when I told her this. She was extremely rude to me. I guess she thought I was trying to scam them. I left and looked up their membership rate online, and it's $5. You'd think she would have politely said, "Oh! It's only $5 and you obviously like our store, so why not join?" but no. She was so rude that I've never considered going back. That's my Kitchen Aid mixer story. What a great giveaway! My favorite kitchen item is new to my kitchen but has been around a long time. It's my great-great-grandmother's castiron skillet. Oh my goodness, I tear up everytime I use it. To think I'm cooking in at least a fifth generation pan is just awesome. I miss that store so much! We don't have them here in FL. My favorite kitchen appliance is definitely my KA mixer. I can make so many things in there! My favorite kitchen item is my Calphalon pots and pans. Since I use them every day-- I wouldnt know what to do without them. My favorite kitchen item was a bridal shower gift from my parents - my KA stand mixer. It's amazing and I'm always impressed by the amount of things it can do! my 'gift' was a hand me down...given to me by hubs from his mom (after her passing)...it was bulging, old and full of memories...I treasured it and it finally succomb to it's age..died. so, I'm hoping this year will bring me a new one. Favorite kitchen item? It's almost like you have told me to choose a favorite child. I had to think about this before commenting as I love almost everything in my kitchen. As far as most used and one I am absolutely in love with - I suppose my Shun Chef's knife. My hubby bought it for me and I reach for it nearly once a day. I love all my Crate & Barrel items but I have to say my favorite item in my kitchen is one of the old mugs that I got from my parents house. My mother purchased the set back in 1980 when we moved to our new house and it just makes me feel so warm to drink a nice cup of tea from it. It's silly, but I love my cake tester. It's really just a long metal stick, but I get so much use out of that thing! My mom bought it for me for $1 at a Pampered Chef party years ago. I'm also partial to my spoonulas! My favorite items definitely have to be my pampered chef stones...I was gifted them as a wedding present and I just love them! "my favorite item is our pampered chef garlic press, I love to cook with garlic and use it daily. Best wedding present we got!" Without a question, my favorite kitchen item is my KA mixer. My favorite kitchen item is my Kitchenaid mixer. It makes baking so much easier. I just love it! My favorite is my immersion blender. It was a gift from my daughter and is used frequently. Love my other toys too, but this is the best. My favorite kitchen item is a stack of different colored coffee cups in their own stand. They spotted the cups and my son immediately said they were "me" and he went back to the store after his wife got back home and bought them. He carried these cups in his back pack on the planes and tried to be careful so they didn't break. One cup has a tiny chip ... and you know what? It is my favorite. It speaks of the loving journey in getting here. My favorite kitchen item is my KA mixer. I use it for everything including making pasta grating cheese and slicing veggies. My most favorite kitchen appliance is hands down and seems to be the popular choice my KA mixer, which happened to be a birthday present to myself. My husand didn't realize how much I would love this sort of thing as a gift. It has also made my life in the kitchen so much easier. I love my kitchen aid mixer, of course, but for something different I love my mini cookie scoop. It's so cute and helps ensure all my cookies are the right size and bake evenly. My favorite kitchen item is my le creuset. How I ever survived without it is beyond me. I can make practically anything I want in it and it heats sooo evenly! I love it! My favorite kitchen item is my cuisinart. It makes life easier and it was the first big ticket kitchen appliance I bought myself. I am 47, and for Christmas when I was 25, my Mom and Dad (both gone to Heaven now) got me a Kitchen Aid Mixer!) I love it, still use it and cannot LIVE without it! It is an essential. When I used it this Christmas I thought of my precious Mom who passed away this previous year... oh the memories! I have to say my favorite kitchen item is my zester. Is that weird? I use it more than any other tool, except maybe my wood paddle. I love it so much, I got my mom one for Christmas. I also adore my glasses, a fabulous Crate and Barrel find. They're the Impressions glassware. So simple and pretty. My most used item is my chopper. It is hand held and easy to use. My favorite is definitely my Kitchenaid stand mixer. However, it is so old that I wish someone would give me a new one in one of the great colors they now have. There's nothing wrong with my old one though, so I doubt I'll get a new one. My favorite wedding gift that I use everyday is a set of unbreakable nested glass bowls from C&B. For almost 8 years those bad boys have done their job....and have not broken or chipped. My favorite kitchen item is probably my crockpot. It was a gift from myself at Christmas. No special story I just use it alot. definitely my kitchenaid stand mixer - its so versatile and useful! i actually have an awesome vintage one that i received for donating to a local organization, and then i fixed it up a bit and refurbished it myself! It would have to be my Vita-Mix. It can puree anything in seconds and makes great smoothies, soups, baby foods, etc. When my husband and I were first married, we got some cash for our wedding and our Vita-Mix was the first thing we bought. Totally worth it. That's a hard choice! But I'll go with my red Le Creuset oval oven, which a good friend gave me for a shower gift. I love the color, the shape, the sturdiness, the ease of clean up and just how versatile it is. Quite frankly, I just love it! My favorite would have to be my KA Mixer. My husband gave it to me for my birthday this last year and I was completely shocked that he thought of it. I only started to really get into cooking and baking over the past 2 years, I didn't even know he knew I wanted one. It is dearly special to me and makes some very yummy things. An old Henckels knife from my Mom's kitchen. I love my pampered chef chopper (I don't know if that is what it's actually called). I use it the most for garlic and onions and I actually want another one to use for non-smelly items (mostly nuts). I love it because it is so easy to use and it is small enough that I can store it on the ledge of my stove for easy access. My mom gave it to me for my birthday. All of the women in the family have one and we call it the bam, bam, bammer (because that's how you use it...bam bam bam). I favorite kitchen appliance would have to be my food processor. I got it as a gift from my MIL and makes my life so much easier chopping vegetables. I can't wait to use it when I start making home made baby food in a few months. I love our Kitchenaid Profession 6 quart Stand Mixer in Licorice. We were inspired by Alton Brown and had it airbrushed with silver and white flames. We always get compliments on it and love using it! My favorite is my set of knives. I always needed good knives and probably complained more than once that I lacked them. Then one year, my son saved up and bought this set for my Christmas gift. They mean alot to me because he was young yet planned and saved to get something I wanted. That Parker Mixing Bowl Set is awesome! I love all the colors. My favorite gadget would have to be my new Kitchen Aid Mixer. Me and my sister have begged for one for probably a good 5 years, and we got one this Christmas! It makes baking so much easier, and it's not too bad to look at either. Thanks for the giveaway, you couldn't be more generous. My favorite item is a hand-thrown casserole dish with a lidthat we received as a wedding gift. It is beautiful and heavy, but I never used it much until the no-knead bread craze. I now make bread every week in it -- it is the perfect size and makes excellent, crusty bread! Ahh...this is a hard one. It's between my KA Mixer or my Grandmothers wooden spoon. When I was little I always loved wooden spoons and when I was in Kansas last Thanksgiving, I landed TWO of my grandmothers spoons! I use them for everything! And my KA mixer. Well when I didn't think I was getting anything for Christmas, I got a Brand Spanking New KA mixer from my in-laws. DH was mad because I got that and it was supposed to be for "us", so I told him the first thing I will make will be his favorite cookies. Well we thought it was broken, so I had to wait, and a WC Nestie saved it, come to find out there is a little knob in the back that is supposed to click in. His favorite cookie was the second thing I made. My favorite kitchen item, right now anyway, is my pizza peel. My mom gave it to me this past Christmas. I love making homemade pizzas especially thin crust ones. The peel makes it so easy to slide them onto my hot stone. Now I just need a bigger pizza stone! I'm gonna say my cuisinart ice cream maker. Love that thing.....whips up homemade ice cream so fast. We used it every week until winter really came on. My favorite kitchen item right now is a little teapot I got for Christmas from my aunt. It's the perfect size (20 oz) for two cups of tea. It has cute squat shape and a stainless steel insert that makes it super easy to use loose leaf tea. I'm drinking 2-3 pots a day of tea. I can only handle one pot with real caffeinated tea so I'm trying a lot of new herbal teas for the rest of the day. It seems to be popular, but for a good reason, my favorite kitchen item is my shiny red kitchen aid. I use it almost daily! Great giveaway! My favorite kitchen tool would either be my garlic press or my food chopper. Both are from Pampered Chef and I use them both all the time. 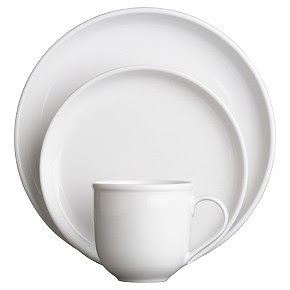 I would love to get new dishes or bowls from Crate and Barrel! I think my favorite item would have to be my KA mixer but only because I use it so often and it makes life so much easier. I do wish it didn't take up so much space on the counter, though.... The mixer was a wedding gift and at the time I wasn't doing much baking or cooking but I'm glad I asked for it as I couldn't imagine life without it now!